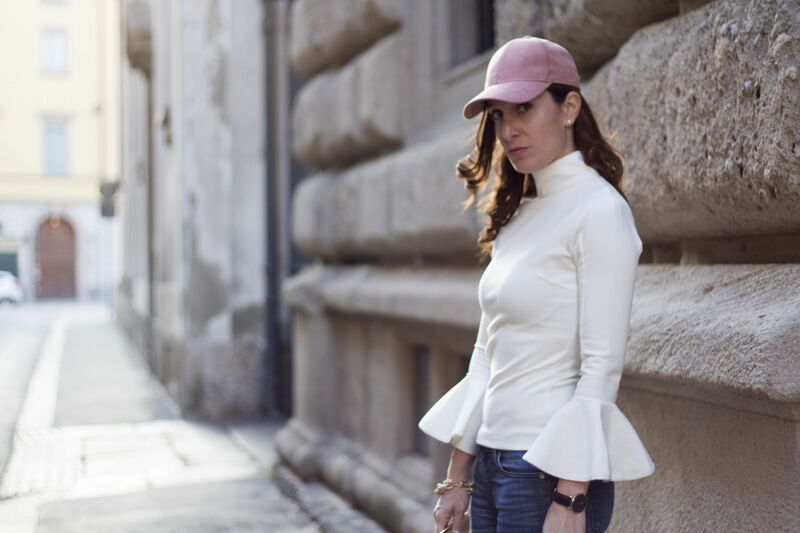 Bell Sleeves And Pink Hat. Spring sunset aperitif time, with a bell sleeves top and the iconic Cult Gaia Ark bag. 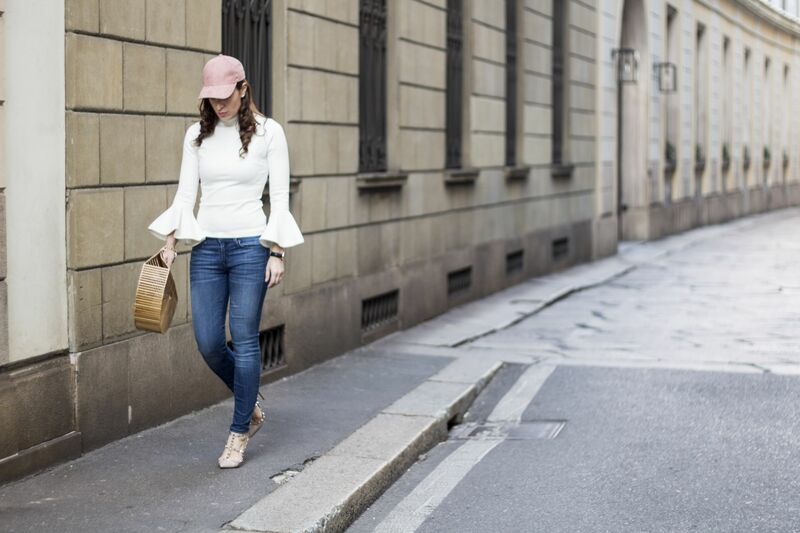 CHIC WISH BELL SLEEVES TOP | CULT GAIA ARC BAG | J.CREW JEANS | H&M HAT (Similar) | VALENTINO ROCKSTUD SHOES | DANIEL WELLINGTON WATCH. 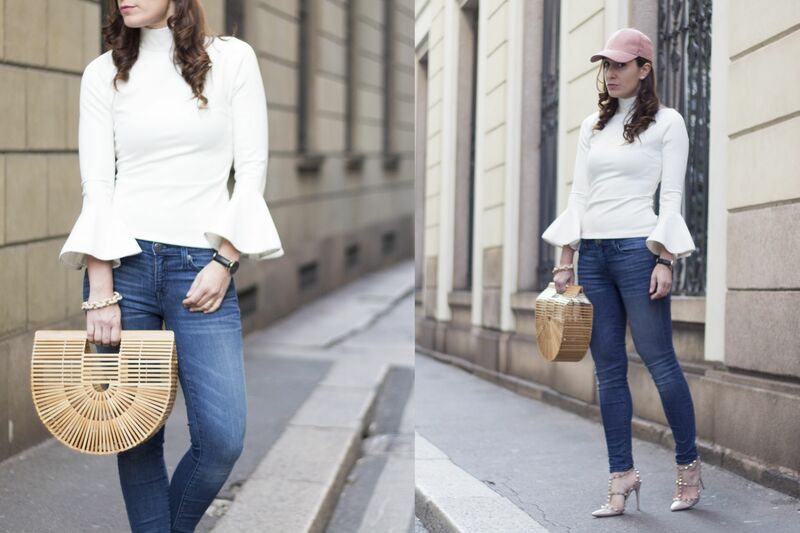 Walking in the sunset light with a bell sleeve white top that gives a romantic and glam accent to whole outfit. I love so much how the sunlight become more and more clear and how it last for a longer period during the day. It allows you to enjoy pretty much more the daylight and to have outdoors aperitifs. I wore this top with denim, pink details and heeled shoes because you know I much I love heels with denim and the boyish/girlish contrast. Taking with me the Cult Gaia Ark bag, that probably is one of my fave for this season. There isn’t a particular reason why I decided to wear also this hat on, but when I when I was getting out I’ve tried it and I loved the result: unconventional and spicy. #CihcTips: pink or soft colors with denim and bell sleeves are a perfect recipe for a bad girl that wants to be romantic as well. Camminando al tramonto con un top con le maniche a campana, che da un tocco romantico e glamour a tutto il look. Adoro come la luce del sole si sia schiarita e allungata verso la sera. Ti permette di godere maggiormente delle giornate e di fare favolosi aperitivi all’aperto. Ho indossato questo top con denim, dettagli rosa e scarpe con tacco, perchè sapete quanto amo i contrasti maschili/femminili. Ho portato con me la borsa Ark di Cult Gaia, che è probabilmente una delle mie preferite di questa stagione. Infine, non c’è un motivo particolare per cui ho deciso di indossare questo cappellino ma, quando stavo per uscire, l’ho provato e mi è piaciuto il risultato: alternativo e ironico. #CihcTips: rosa o colori soft indossati con denim e maniche a campana sono una ricetta perfetta per una bad girl che vuole risultare romantica allo stesso tempo. Things to wish for: a new swimsuit. Previous Post Pink Lace And Black Leather Jacket. Next Post Stripes and Pink Waiting for Summer. Bellissima, questo look lo adoro, fantastico il top e molto originale la borsa! Bellissimo outfit! Mi piacciono molto le scarpe e il cappello è davvero carino! Io non li indosso quasi mai perchè ho le orecchie a sventola! Ma che bello questo look!!!! 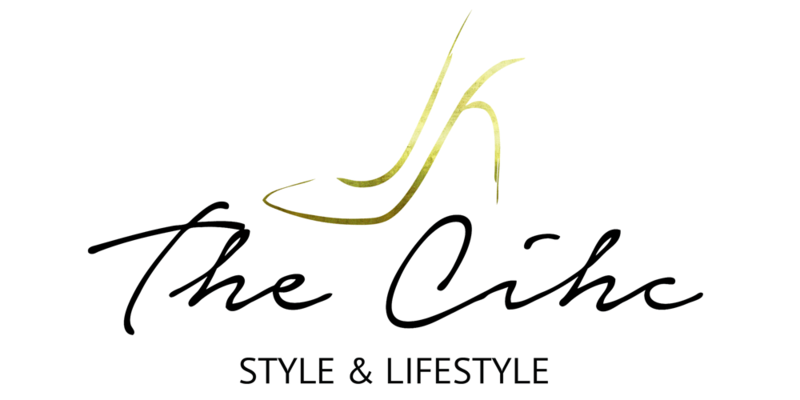 I would like to personally congratulate you as your blog The Cihc has been selected by our panelist as one of the Top 80 Italian Fashion Blogs on the web. I personally give you a high-five and want to thank you for your contribution to this world. This is the most comprehensive list of Top 80 Italian Fashion Blogs on the internet and I’m honored to have you as part of this!